How much does a Power Steering Pressure Hose Replacement cost for your car? The cost of a Power Steering Pressure Hose Replacement depends on the type of car you drive. 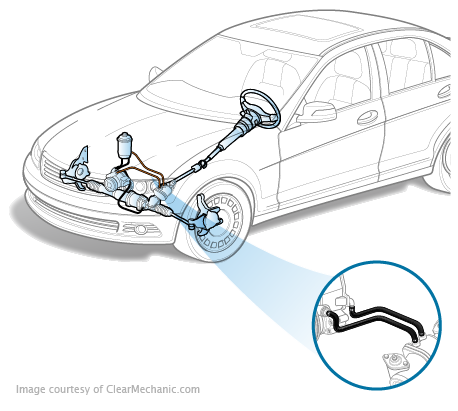 What Is A Power Steering Pressure Hose? Power steering allows you to move the wheel with ease so it doesn’t feel you are throwing out your back every time you want to make a right turn. The pressure hose is what maintains the power steering fluid’s pressure so that it is optimal for driving. Now that’s why driving an several hundred pound car feels like a breeze. If you can’t properly turn your vehicle, you are extremely liable for accidents. Not only does it prevent you from making split second decisions should the situation ask for them, you will be unable to properly make turns when changing lanes at all. In all cases, driving with a faulty power steering pressure hose is a dangerous idea - don’t do it and instead, get this repaired. Rahim was in time. Friendly, courteous & did a fantastic job!